In order to standardize species resolution across all MARINe groups, and over time, some species (typically rare) were lumped for graphical presentation of Long-Term monitoring data. See lumped categories for definitions (some variation occurs between methods and over time). Barnacles in the focal plots for this species group consisted of higher cover of Balanus glandula than Chthamalus fissus/dalli, but a mixture was present in all years. Total barnacle cover fluctuated between about 35%-85% in the 13 years they have been monitored, but in most years was relatively high. In the years when barnacle cover was lower, cover of the rockweed, Pelvetiopsis, increased. Barnacles, both live and dead, provide an excellent substrate upon which Pelvetiopsis can settle, so it is possible that during the years of “low” barnacle cover, barnacles were simply hidden below the rockweed. In 2014 we began keeping track of multiple layers under each point (previously only the top layer was typically scored), which will enable us to know whether species “declines” are real, or simply a result of one species overlaying another. Counts of littorines and limpets were consistently high in barnacle plots at Burnt Hill, and the whelk, Nucella was present in low numbers. 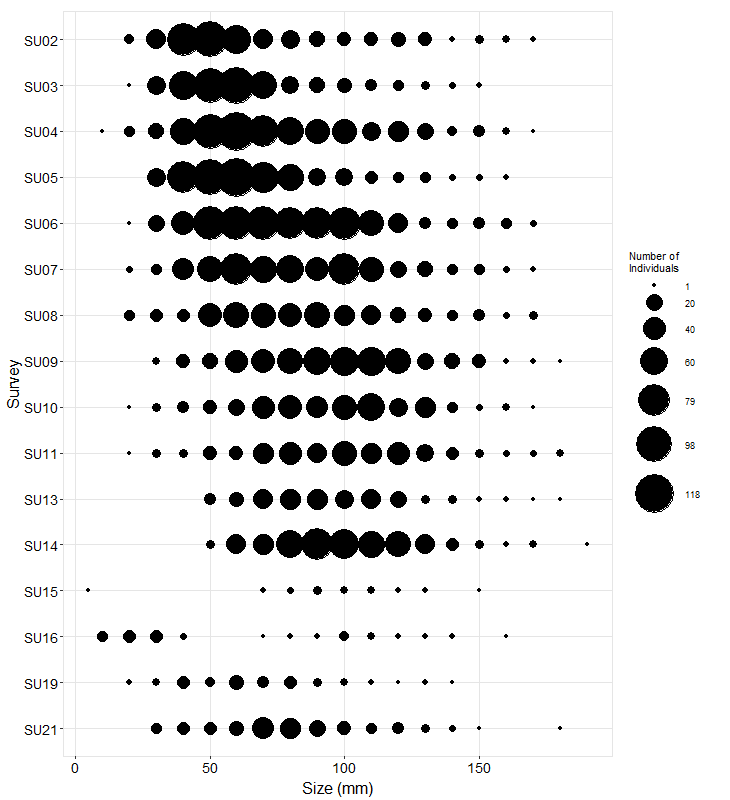 Cover of mussels in Mytilus plots was consistently high over time, fluctuating between 75-100%. Limpets, littorines and Nucella were all common in mussel plots. 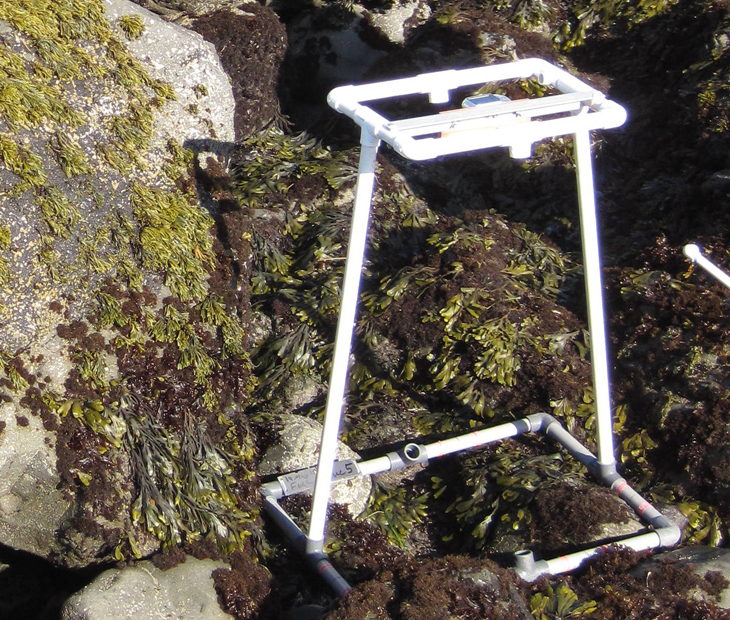 Rockweed cover in Pelvetiopsis plots was high most years, but dipped below 50% in 2008-2010, and again in 2013-2014. These dips corresponded with increases in barnacle cover, and as described above, it is not clear whether these increases were real, or just a result of barnacles being exposed when epiphytic Pelvetiopsis cover declined. Limpets and littorines were consistently abundant in Pelvetioptis plots. In general, Endocladia cover remained moderately high over time in the plots it is targeted in. Dips in cover were sometimes associated with an increase in Mastocarpus, but more often with increases in bare rock, suggesting that space is not a limited resource in these plots. Three groups of motile invertebrates, limpets, littorines and Nucella, were common in most years within Endocladia plots. Phyllospadix transects are located within pools at Burnt Hill, which typically means that cover does not fluctuate as much as in areas where the surfgrass is exposed to air at low tide, and can become dry and bleached out during warm, mid-day low tide periods. 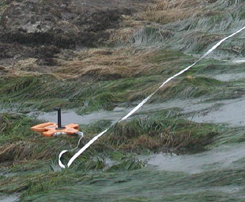 Surfgrass cover was relatively stable, and while a few other species, such as Odonthalia, were commonly present along the transects, none exceeded 25% cover. As with many sites, abundance of the sea star, Pisaster ochraceus, fluctuated substantially over time for this highly mobile animal. 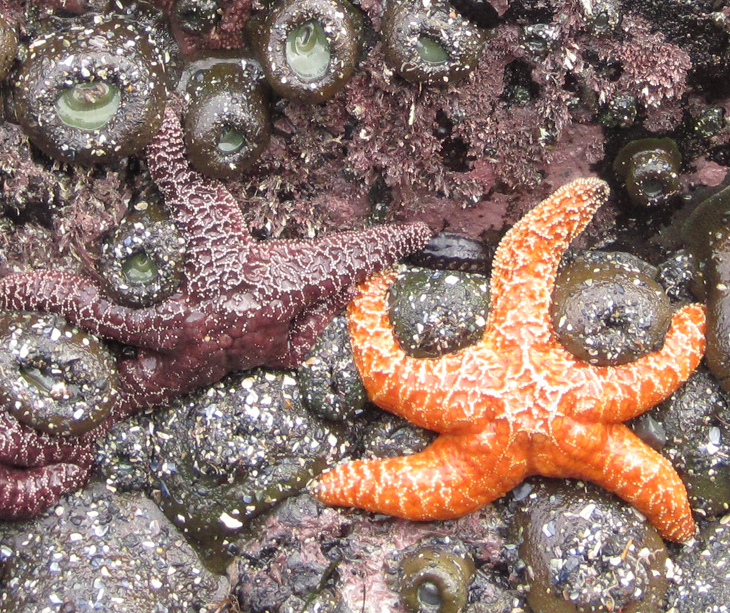 Surprisingly, ochre star numbers remained high in summer 2014, well after declines had occurred along much of the west coast due to Sea Star Wasting Syndrome. We expect that a significant decline will be evident after 2015 data are entered. Most of the ochre stars within our plots were fairly small (40-60 mm radius) when this site was established in 2002. This cohort has grown over time, as reflected by the movement of the “bulge” up the size scale. Most stars in 2014 were between 80-120 mm in radius. Below are the trends observed for each Photo Plot target species at this site. Long-Term percent cover trend graphs also include any species that reached a minimum of 25% cover during any single point in time within a given target species assemblage. Breaks in trend lines represent missed sampling events. For additional species observed that did not meet this 25% threshold, please use the Interactive Map. For motile invertebrate Species Counts, a mean across all plots was calculated, and only those species with a value of at least 5 individuals for at least one sample are shown.﻿ Due to time constraints, motile invertebrate counts have not been done at most sites since 2012. For motile invertebrate size trend graphs by site, please use the Interactive Map. Below are the trends observed for each Transect target species at this site. Long-Term trend graphs also include any species that reached a minimum of 25% cover during any single point in time within a given target species assemblage. Breaks in trend lines represent missed sampling events. Species Counts and Sizes (where recorded) for Pisaster are shown below for this site. At some sites, other sea star species and Katharina are counted in addition to Pisaster. The sum of all individuals across all plots is displayed. Note that data gaps are represented by breaks in long-term count trend lines, but are not shown in size plots.